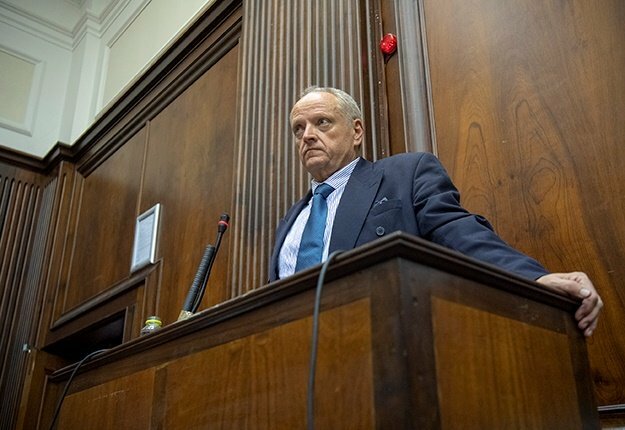 Rob Packham is expected to take the stand in his defence when his murder trial resumes in the Western Cape High Court next month. He has pleaded not guilty to the murder of his wife, Gill, and a charge of obstruction of justice. Her charred remains were found on February 22, 2018, in the boot of her burnt-out car at the Diep River train station in Cape Town after the fire was extinguished. Advocate Craig Webster, for Packham, indicated this week that he would call Packham after the recess. The State closed its case and Webster called his first witness, Warrant Officer Steven Young, on Tuesday. Young is stationed at Diep River police station and has been a police officer for 34 years. He commissioned a statement taken from Keanan Thomas, who was one of the first two witnesses to see Gill's burning BMW that night after hearing a commotion and running outside his home. Thomas testified that he saw a white SUV nearby, through the trees. He said he waved to draw the driver's attention to check if he had called the police but the Audi drove past. He said the driver was a clean-shaven man with a cap on and an aggressive look on his face. At a photo identity parade, he pointed out Packham as the man he had seen. He also pointed out a bespectacled Packham in court as the motorist he had seen. The defence previously raised concerns about Thomas declaring in his statement that he saw a coloured man aged between 30 and 35. In court, Thomas maintained he told police the driver was either coloured or white. Questioned about this aspect, investigating officer Sergeant Ivan Sonnenberg had told the defence he asked Thomas later and he replied it was a person of very light complexion, either "coloured or a white male". Judge Elize Steyn also noted at one point in proceedings that the witness had clarified the race aspect. On Tuesday, Young told Webster that he was not present when Thomas drafted his statement. His colleague interviewed the witness, loaded the statement onto a USB stick, came to his office with Thomas, printed out a hard copy and then asked him to commission it. He confirmed to Webster that he had followed a police standing order by reading back the statement to the witness and making sure he was happy with the contents. Webster asked what would have happened if Thomas wanted to change or amend his statement. Young replied that they would initial any changes before he signed the document. If he had already signed, they would add a supplementary statement. He said he had not seen a supplementary statement for Thomas. "It would most probably be noted in the investigation diary of the case docket." Under cross-examination, he confirmed to prosecutor Susan Galloway that he regularly commissioned statements for his colleagues. Asked if there was anything out of the ordinary with the way in which Thomas' statement was commissioned, he replied: "Not to my knowledge." The trial was postponed until April 15. Packham, who remains in custody, was seen talking with his daughters for a while before being led away by a police officer.